Has The World Gone Mad? 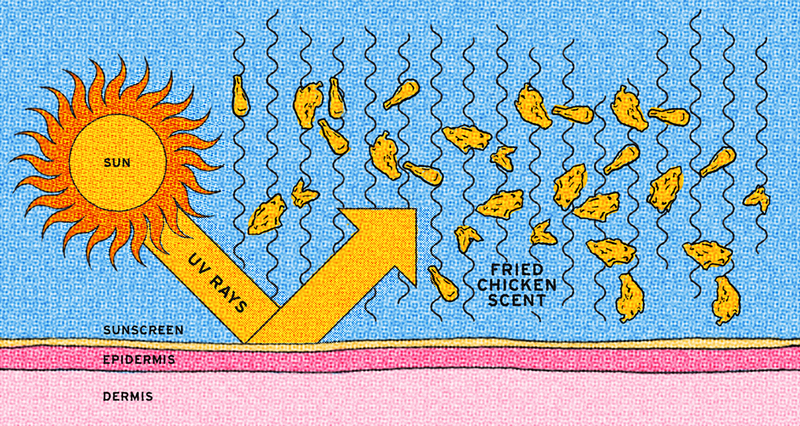 KFC Launches Fried Chicken Scented Sun Cream! Now you can smell like fast food on the beach...errrm, okay then. Have you ever wished you could mix a bit of your takeaway chicken in with your sun tan lotion? Nope, us neither, but that didn't stop the *ahem* imaginative bunch at KFC from doing just that! Following the success of their hugely successful (yes really) fried chicken flavoured nail varnish, KFC has created a friend chicken scented suncream for anyone who wants to literally smell like they've fried on the beach. Euggh, pass the sick bucket! KFC put 3,000 bottles of the special sun tan lotion up for grabs on its website and they're ALREADY gone. Yup, 3,000 people want to smell like tasty chicken drumsticks on the beach. Well, rather them than us! A KFC spokesperson told Fortune magazine: "We’ve had a lot of fun with our Extra Crispy Colonel campaign this summer and the sunscreen idea seemed like a natural fit. Our chicken is hand breaded and freshly prepared in our kitchens all day every day, which makes the smell in our restaurants unparalleled. The Extra Crispy Sunscreen is a fun way to leverage that with our fans." Would you wear fried chicken suncream? No? What if we dared you?